From the 2005 story "Mobile food trailer ban on hold; family businesses await decision"
As I was recently reminded by Middle Tennessee Hispanic Democrats Secretary Freddy Quiteño, Hispanic Heritage Month is not just about parties, but about Hispanic heritage itself. Touché. The idea of HispanicNashville.com is to capture Nashville's unique Hispanic heritage day by day, and looking back on that heritage (in the form of this site's archives), what strikes me is that the first month of news published on HispanicNashville.com - October 2003 - already revealed quite a tapestry of local stories. 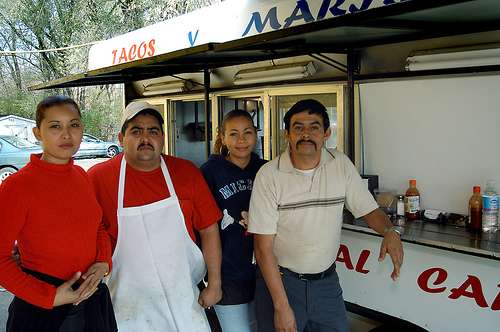 Those seven-year-old headlines remind me that Nashville's Hispanic heritage is formed by many stories, all written locally. You don't have to go back hundreds of years or cross international boundaries to celebrate our city's Hispanic heritage. And you don't have to think of heritage as a faceless history, either. 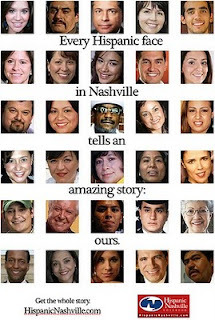 As this ad put it last December, "Every Hispanic face in Nashville tells an amazing story: ours." ATTORNEY ANA ESCOBAR RANKS SECOND IN NASHVILLE BAR ASSOCIATION RATING OF CANDIDATES FOR DAVIDSON COUNTY GENERAL SESSIONS JUDGE. CHEEKWOOD HOLDS 4TH ANNUAL "DÍA DE LOS MUERTOS FALL FAMILY CELEBRATION"